Your one off stop to sell your Subaru car, van, Ute, 4×4 & SUV. 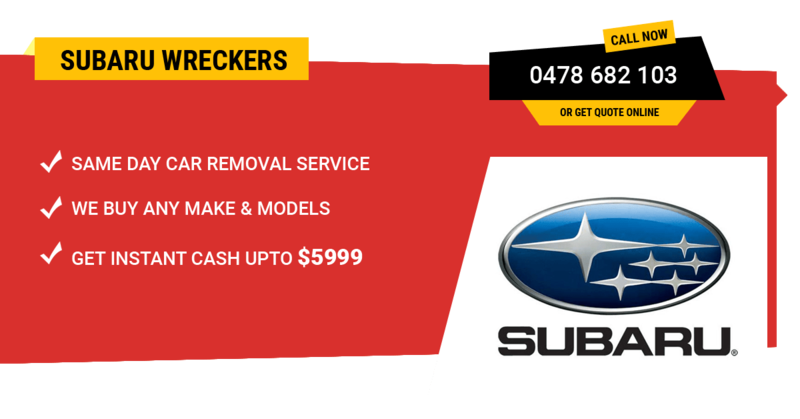 Here at Wreck Monster, we are proud to be one of premier Subaru Wreckers in Sydney, NSW. We have the top spot due to our undying dedication to paying only the most cash to people for their old and unwanted Subaru’s. Our auto wrecking team of seasoned professionals have all the skill and know-how that only years of experience can provide. And they use it to make your experience in selling to us extremely convenient and stress free. No-one needs to put up with having old scrap cars clogging up their property and looking messy and nasty any longer. It is no longer impossible to get rid of junk Subaru’s. Check out our services for more details. If you are keeping the old, broken, rusted, accidental or unwanted Subaru vehicle and wanting to sell that for the top cash then you are at the right place. This is because we buy Subaru’s, and we pride ourselves on the fact that we provide the fastest and easiest method for folk to sell their Subaru’s. If you sell your Subaru to us, you stand to have it gone from your property within the same day. Being a member of Sydney’s auto recycling establishment, this is our primary responsibility to remove all the unwanted vehicles from the Sydney and an immediate suburbs. We buy all models of Subaru brand and love to pay top cash for Subaru Forester, Legacy, Impreza, Trafiq, WRX, Ace, SVX, Baja, BRZ, Outback, XV and much more. Check out the full list of Subaru vehicles. Wreck Monster can hold the large number of Subaru vehicles because we have the largest scrap yard in the Sydney, NSW. We have enhanced the number of crew members and the equipment’s with brand new technology. Using the latest technology, we can recycle the vehicles in a safe way. You may have found in the past that the worse a car’s condition, the harder it is to sell. This won’t be the case with us. All vehicles are equally as easy to sell when selling to us. You won’t have to clean the vehicle, you won’t have to make any repairs to make us more likely to buy it. Just offer it to us, we will make you an offer, and then we will buy it off you. There is no stress or hassle involved at all. It is incredibly easy to find out how much your Subaru is worth. All you have to do is contact us via one of these two methods. One is via phone. The phone number is 0478 682 103. But we realise that a lot of folk actually prefer to do this online. So with this in mind we also have a form on our website that you are invited to fill out. As a leading Sydney Wreckers, we pay top cash for Subaru cars and other unwanted vehicles. Generally, we offer the maximum price. We are able to do so because our professionals are the best in the business at looking at any vehicle’s key details and calculating how much it will be worth. However, you are always welcome to come up with some offer in your mind and we will see if we can make it up for you. Your Subaru isn’t running? You won’t have to pay a tow truck company to transport it to the local junk yard. This is because we are here. We don’t believe in making the owners of junk cars pay for their vehicle to be removed. Instead, we subscribe to the cash for cars service practice of doing all the removals for free. We turn up to your place, or where-ever the Subaru in question is located, and we pay you instant cash on the spot. It is only after you receive the sweet payment of top cash that we use our equipment to go about removing your car from your property. Get the free Subaru removal anywhere in Sydney, NSW or an immediate suburbs. This includes Ultimo, Greenacre, Baulkham Hills, Campbelltown, Richmond, Penrith, Liverpool and Parramatta. If you are wanting the same day removals then please verify your location beforehand. Every now and then, a Subaru needs repairs. And if there is one thing you can expect to have to do when making repairs on your much loved Subaru, it is to have to replace a part. But if you are on a tight budget, you may not want to pay through the nose for a brand new part. Why do that when second hand parts are often just as good, but much more affordable? Fortunately, Wreck Monster is here to save the day. You will have no trouble finding the part that you need if you look for that part with us. The used Subaru parts that we sell aren’t just in great condition. They are also tested to make sure that they will perform perfectly. We then add the part to our inventory and you can buy it at affordable prices. Our inventory of parts could be compared to a giant buffet, where everything is accounted for. You won’t have a struggle searching for a used part. Just leave some vehicle details with us and we will find the right part for you. Book auto parts online and we will send it to your door. You don’t have to tolerate the normal and traditional methods of selling cars anymore. We here at Wreck Monster provide the community with the quickest and easiest way to sell any vehicle, including Subaru’s. Just give us a call or text on 0401 333 393 or fill up one of our quote form on the website and explain about your vehicle as much as possible. We will come back to you with the best cash offer for your Subaru vehicle.